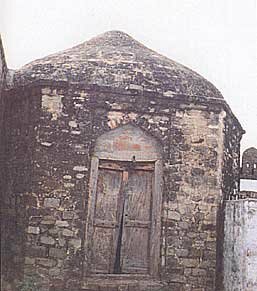 Let's celebrate the greatness of Sri Gobind Singh Sahib Ji and Mata Sahib Kaur Ji and honour the Gursikhi Jeevan of three of their children, Bhai Parminder Singh Ji, Bhai Charnjit Singh Ji, and Bibi Rena Kaur Ji, who graced the Sikh youth with their amazing presence, and by Akaal Purakh's hukam left this world stage at a very young age. 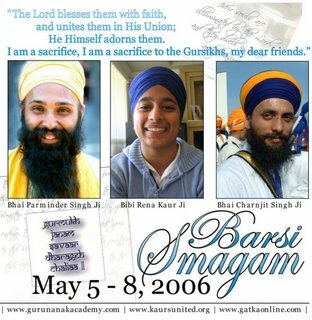 Join the Sikh youth of BC in the 2nd Annual Barsi Smagam from May 5 to May 8, 2006 and join the Ottawa Sangat on May 13, 2006. 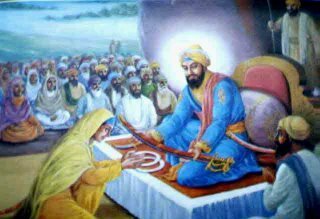 The minds of the Gursikhs rejoice, because they have seen my True Guru, O Lord King. 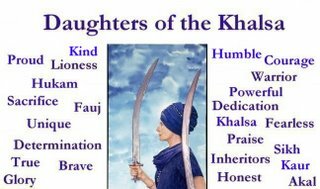 If someone recites to them the reminder of the Lord's Name, it seems so sweet to the mind of those Gursikhs. 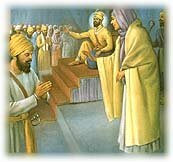 Those Gursikhs are robed in honour, hereafter in the Court of the Lord, as my True Guru is very pleased with them. Servant Nanak has become the Lord, Har, Har; the Lord, Har, Har, abides within his mind. *Any scheduled program may be subject to some changes. - Please note the Sri Akhand Paath Sahib will not take place in the same location as last year. 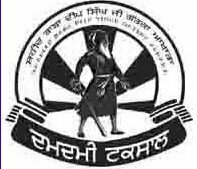 For the Barsi Smagam this year, Guru Maharaj's Takhat Darbaar will be set up for the Sri Akhand Paath Sahib in the large room adjacent to the Langar Hall. 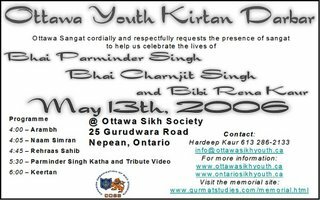 Ottawa Sangat humbly and lovingly requests Sangat's presence at the Annual Keertan Darbar in memory of Bhai Parminder Singh Ji, Bhai Charnjit Singh Ji, Bibi Rena Kaur Ji. Last year, this Darbar took place in Toronto, and this year it will take place in Ottawa. Turn Right onto Laser Road. Turn left at Stop Sign onto Gurdwara Rd. 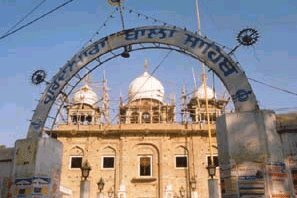 Gurdwara Sahib is on the right hand side. Russel Becomes Hawthorne. Continue on Hawthorne Rd. Turn right at Laser Rd. At stop sign, turn left onto Gurdwara Rd.